Electroencephalography (EEG) concurrently acquired with fMRI provides high temporal resolution information about brain activity as well as subject head movement. We introduced an EEG-assisted retrospective motion correction (E-REMCOR) method that utilizes EEG data to correct for head movements in fMRI on a slice-by-slice basis and substantially improves the quality of the data. To further enhance the usability of E-REMCOR, especially for the large-scale EEG-fMRI studies, we developed an automatic and improved implementation of E-REMCOR, referred as aE-REMCOR. 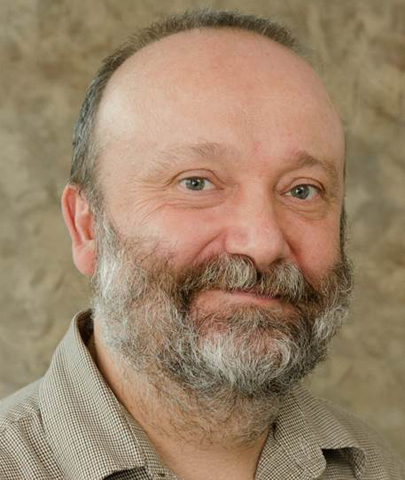 This user research summary is primarily based on articles [1,2] published as Vadim Zotev, Han Yuan, Raquel Phillips, Jerzy Bodurka (2012) EEG-assisted retrospective motion correction for fMRI: E-REMCOR. NeuroImage 63, 698-712, doi: 10.1016/j.neuroimage.2012.07.031, and Chung-Ki Wong, Vadim Zotev, Masaya Misaki, Raquel Phillips, Qingfei Luo, Jerzy Bodurka (2016) Automatic EEG-assisted retrospective motion correction for fMRI (aE-REMCOR) NeuroImage 129,133-147, doi: 10.1016/j.neuroimage.2016.01.042. Electroencephalography (EEG) recordings performed simultaneously with fMRI provide high temporal resolution information about ongoing brain activity as well as head movements. A method is introduced for EEG-assisted retrospective motion correction of fMRI (E-REMCOR) that employs the EEG array as a sensitive motion detector during fMRI. EEG motion artifacts are used to generate motion regressors describing rotational head movements with millisecond temporal resolution. These regressors are utilized for slice-specific head motion correction and to improve quality and usability of fMRI data. To facilitate the application of E-REMCOR in large-scale EEG-fMRI studies, an automated and improved implementation, referred to as aE-REMCOR, is described. The aE-REMCOR algorithm, implemented in MATLAB, enables automated preprocessing of the EEG data, independent component analysis (ICA) decomposition, and, importantly, automatic identification of head motion and cardioballistic-related independent components (ICs), which can further improve fMRI data and facilitate utilization of EEG-fMRI in large clinical studies. E-REMCOR is based on the observation that voltage artifacts induced in EEG leads due to rigid-body movements of the head in the uniform magnetic field of an MRI scanner can be analytically related to time derivatives of real-time rotational head motion parameters. EEG motion artifacts then can be used to generate motion regressors describing rotational head movements with millisecond temporal resolution. These regressors are utilized for slice-specific motion correction of unprocessed fMRI data. Application of E-REMCOR for fMRI motion correction includes three steps. First, after MR-artifacts removal, an independent component analysis (ICA) is performed for the EEG data to identify motion and/or cardioballisitic (CB) artifacts. The identification criteria for random head motion are outlined in. Second, each motion-related independent component (ICk) is band-pass filtered and integrated over time to yield two E-REMCOR regressors, to ensure that short-term effects of rapid head movements are explicitly described by the regressors irrespective of the presence of long-lasting slow motions, having the same temporal resolution as the EEG data. Third, the E-REMCOR regressors are sub-sampled to match the acquisition times for each slice in the fMRI dataset and linearly detrended. Correction of motion artifacts in the unprocessed fMRI data is performed by means of a linear regression procedure applied to each fMRI voxel’s time course. Thus, the E-REMCOR motion correction is performed on a slice-by-slice basis, and can be applied simultaneously with RETROICOR. It is usually followed by the standard fMRI data processing with slice-time adjustment and volume registration to correct effects of slower head motions. We automated and streamlined the practical use of E-REMCOR for large datasets and/or groups of subjects. An advanced algorithm for automatic identification of head-motion-related as well as CB-related ICs was developed. The algorithm, implemented in Matlab, automatically characterizes and recognizes the special features of the artifacts imposed on the mean power spectral density, topographic map, and EEG signal contribution of the ICs. The aE-REMCOR automation algorithm is illustrated in Fig. 1. Fig. 1: The sketch of automatic identification of ICs through the analyses of the mean power spectral density, topographic map and contribution to the EEG signal. Possible blink and saccade ICs are removed from the motion ICs selection. Reproduced from Wong et al. (2016) NeuroImage . 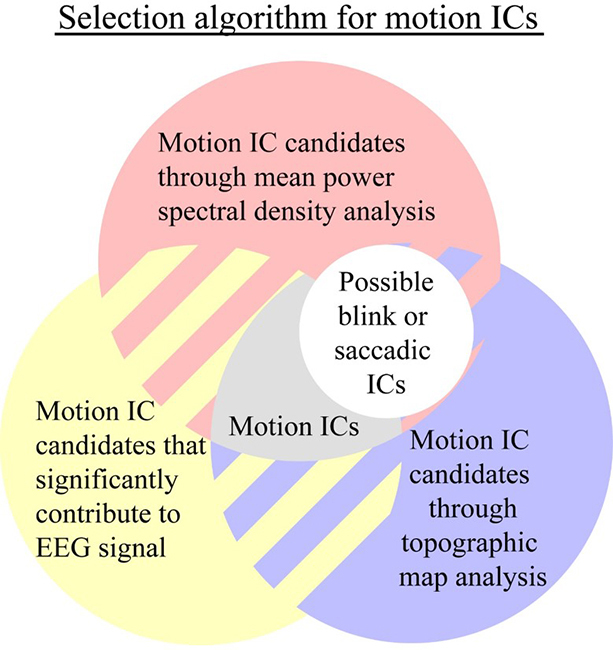 ICs related to rapid head motion and cardioballistic motions are recognized when the criteria in the analyses of mean power spectral density, topographic map, and EEG signal contribution are simultaneously satisfied. Eye blink ICs and saccadic ICs are also identified in addition to the head motion ICs to ensure proper separation of head movement and eye movement artifacts. Subjects provided IRB-approved written informed consent. Subjects wore an MR-compatible EEG cap (BrainCap MR from EASYCAP GmbH; 32 EEG, 1 ECG electrodes, 10-20 system). For fMRI, a single-shot gradient echo EPI sequence was used. Concurrent EEG recordings were performed using a 32-channel BrainAmp MR plus amplifier (Brain Products, GmbH). The superb temporal stability of pulse sequence parameters provided by the GE MR750 scanner enabled EEG-fMRI recordings with high measurement resolution (0.1 μV). The EEG system’s clock was synchronized with the 10 MHz MRI scanner’s clock using Brain Products’ SyncBox device. Additionally, the EPI sequence was custom-modified (to achieve 1μs TR accuracy) for accurate correction of MRI artifacts in the EEG data. The study included three EEG-fMRI scanning sessions. Each session lasted for about two hours and was separated by approximately one week. In each session, there were five real-time fMRI neurofeedback (rtfMRI-nf) training scans and two resting scans immediately before and after the rtfMRI-nf training scans. In total 305 EEG-fMRI scans were processed in the analysis, which includes 219 rtfMRI-nf training scans and 86 resting scans. MATLAB® and EEGLAB were used for EEG preprocessing and ICA. fMRI data analysis was done in AFNI. The correction performance of aE-REMCOR on the fMRI dataset was examined using temporal signal-to-noise ratio (TSNR), motion parameters of the brain voxels, and improvement in the resting state fMRI (rs-fMRI) connectivity analysis[10-11]. Figure 2 shows the automatic results of aE-REMCOR with identified motion ICs from scans with example of significant rapid head movements. Five motion ICs are identified (Fig.2a-c). Fig. 2: The automatic results of aE-REMCOR with identified motion ICs in a scan with severe rapid head movements. (a) The time courses, (b) spectra, (c) topographic maps of identified motion IC. (h) The close-up of the red box in (a). Reproduced from Wong et al. (2016) NeuroImage . The 1st, 2nd, 4th and 5th IC (F1(t), F2(t), F4(t), F5(t)) are identified as the rapid head movement ICs, and the 3rd IC (F3(t)) is identified as the cardioballistic motion IC. Figures 2(d)-(f) show the maximum displacement of the voxels for each brain volume (D), the root mean square difference between an fMRI volume and the 1st volume (rms), and the motion parameters (roll, pitch, yaw, dS, dL, dP) calculated by AFNI 3dvolreg. Fig. 2 continued: The automatic results of aE-REMCOR with identified motion ICs in a scan with severe rapid head movements. (d) The maximum displacement of the voxels (D) for each brain volume. (e) The root mean square difference (rms) between an fMRI volume and the 1st volume. (f) The rotation angles roll, pitch, yaw and the displacements along the superior (dS), left (dL) and posterior (dP) directions calculated by AFNI 3dvolreg. (g) The ∆TSNR plots on the slices of the brain along the axial direction without volume registration (upper plot) and with volume registration (lower plot). In (d) – (f), the results with and without aE-REMCOR are respectively plotted in red and black lines. Reproduced from Wong et al. (2016) NeuroImage . The spikes in D, rms and motion parameters indicate the occurrences of the rapid head movements. With the application of aE-REMCOR, the spikes in Fig. 2(d)-(f) are significantly reduced. The aE-REMCOR improvements in resting state fMRI functional connectivity are shown in Fig. 3. Fig. 3: Resting state connectivity of the default mode network (DMN). 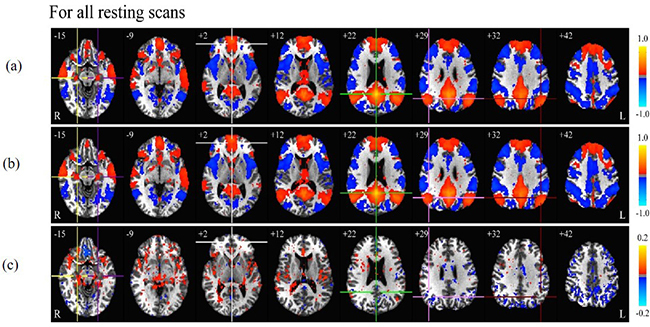 (a) – (b): Group correlation map without and with aE-REMCOR for all 86 resting scans. (c): Group correlation difference for all the resting scans ((b) – (a)). The centers of the ROI in PCC (0, -52, 22), mPFC (0, 49, 2), LatPar-L (-45, -60, 32), LatPar-R (43, -60, 29), HF-L (-22, -19, -15) and HF-R (22, -19, -15) of the DMN are respectively marked with green, white, maroon, pink, purple and yellow crosshairs. Indicated next to each slice image is the z-coordinate of the slice. For the group analysis in Figs. (d) – (i), uncorrected p < 0.001 is used. Reproduced from Wang et al. (2016) NeuroImage . The group correlation maps of the default mode network (DMN, seed PCC) for all resting scans are plotted in Figs. 3(a) and (b). The corresponding group correlation difference ((b) – (a)) is shown in Fig. 3(c). When all the 86 resting scans are considered, the motion-induced connectivity artifacts (Fig. 11(c), in) disappear. This shows the reduced significance of motion artifacts on the DMN connectivity when sufficient scans with little head motion are considered. Nevertheless, when the entire group of subjects exhibits significant rapid head movements, slice-by-slice fMRI motion correction is particularly important to improve the accuracy of the rs-fMRI connectivity analysis. 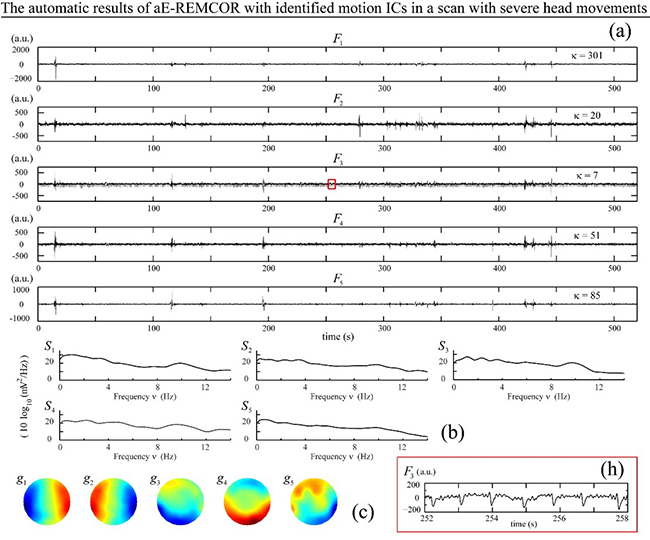 An EEG-assisted retrospective motion correction (E-REMCOR) method and its automatic extension (aE-REMCOR), which utilize EEG data to correct for head movements in fMRI on a slice-by-slice basis, are reported. The aE-REMCOR automatically preprocesses and analyzes the EEG data, identifies the independent components (ICs) corresponding to head motions, and constructs EEG-based regressors with the identified motion ICs. The entire automatic procedure is carried out in MATLAB. The motion artifacts in the fMRI images are corrected with the motion regressors in AFNI. The automatic identification of the motion ICs is achieved by recognizing the special features of the motion artifacts imposed on the mean power spectral density, topographic map, and EEG signal contribution of the ICs. An automatic algorithm for motion IC identification was developed. The algorithm is shown to be capable of identifying the ICs related to rapid head movements and cardioballistic motions as well as the dominant component in the mixture of them when the ICA fails to separate the different motion components completely. The aE-REMCOR does not require any specialized equipment beyond the standard EEG-fMRI instrumentation and can be applied retrospectively to any existing EEG-fMRI data set, which can substantially benefit fMRI analysis. In addition, the aE-REMCOR can be conveniently and efficiently used to improve fMRI motion correction in large clinical EEG-fMRI studies. Zotev, V., Yuan, H., Phillips, R., Bodurka, J., 2012. EEG-assisted retrospective motion correction for fMRI: E-REMCOR. NeuroImage 63, 698-712. Wong, CK., Zotev, V., Misaki, M., Phillips, R., Luo, Q., Bodurka, J., 2014. An automatic EEG-assisted retrospective motion correction for fMRI (a-EREMCOR). NeuroImage 129, 133-147. Allen, P.J., Polizzi, G., Krakow, K., Fish, D.R., Lemieux, L., 1998. Identification of EEG events in the MR scanner: the problem of pulse artifact and a method for its subtraction. NeuroImage 8, 229-239. Bell, A.J., Sejnowski, T.J., 1995. An information-maximization approach to blind separation and blind deconvolution. Neural Comput. 7, 1129-1159. Glover, G.H., Li, T.Q., Ress, D., 2000. Image-based method for retrospective correction of physiological motion effects in fMRI: RETROICOR. Magn. Reson. Med. 44, 162-167. Zotev, V., Krueger, F., Phillips, R., Alvarez, R.P., Simmons, W.K., Bellgowan, P., Drevets, W.C., Bodurka, J., 2011. Self-regulation of amygdala activation using real-time fMRI neurofeedback. PLoS One 6, e24522. Delorme, A., Makeig, S., 2004. EEGLAB: an open source toolbox for analysis of single-trial EEG dynamics including independent component analysis. J. Neurosci. Methods 134, 9-21. Cox, R.W., 1996. AFNI: software for analysis and visualization of functional magnetic resonance neuroimages. Comput. Biomed. Res. 29, 162-173. Bodurka, J., Ye, F., Petridou, N., Murphy, K., Bandettini, P.A., 2007. Mapping the MRI voxel volume in which thermal noise matches physiological noise – implications for fMRI. NeuroImage 34, 542-549. Van Dijk, K.R.A., Sabuncu, M.R., Buckner, R.L., 2012. The influence of head motion on intrinsic functional connectivity MRI. NeuroImage 59, 431-438.